Isshi Bunshu (alt. 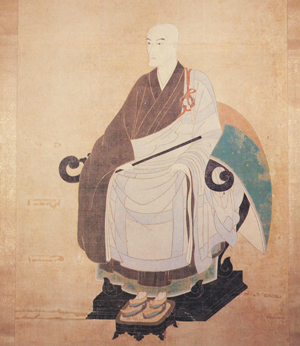 Monju), a most renowned Rinzai Zen abbot whose master was the great Rinzai Zen master Takuan Sōhō (1573-1645), lived from 1608 to 1645 (or 1646). Here is a scanning (thoroughly retouched) of a xerox copy of the original hand-scroll, supplied to me in 1985 by the Kōkoku Temple in Yura, Wakayama. As with the Kaidō honsoku of 1628, Abbot Isshi's Letter to the komusō Sandō Mugetsu represents an equally important source of 17th century Fuke Shakuhachi ideology. Here follows (an attempt at) a preliminary English translation of the document, almost complete, as of Spring, 2013 (the paragraphing is mine). Trust me: This text is definitely a major challenge! 【?】 = missing or illegible kanji in the original manuscript. 【kanji】 = probable character inserted where a kanji is missing or illegible in the original manuscript. (kanji) = notes added/inserted in the original manuscript in different writing style/hand. * following a kanji = the preceding kanji was written with a non-standard or old version of the ideograph in the original manuscript by Isshi Bunshu. - Opening paragraph – Worm-eaten - upper right corner of the scroll damaged by insects. 1 kanji: “… at …” [Jap. : ni oite]. 1 kanji: ”… honor(able) …”[Jap. : ki]. “Later, the paths [lit. : 'branch veins'] of these honorary men separated into four, respectively [thus totalling 16], and - travelling in all directions - wherever they came they brought relief to the Buddhist community." “And so, hurrying in the East and hastening in the West, they simply wander absentmindedly [or, ‘in vain’] around people’s gates; and that is so indeed! “The shakuhachi is made from a piece of bamboo with 3 joints [or, ‘nodes ‘, Jap. : mi-bushi] with a hollow cavity [cut out] inside of it. “The ancients [lit. : ‘old people’] used a single pipe and produced [lit. : ‘intoned’] a single sound. If there were not 5 pipes, it was difficult [i.e. : ‘impossible’] to intone [or, ‘tune’] the five notes. “Some oral traditions [call it] chiku-teki [alt. : take-bue - i.e. : ‘bamboo flute’]; some [call it] shakuhachi. Some oral traditions [call it] gyoku-shō [i.e. : ‘jade flute’]; some [call it] dōshō [Chin. : t’ung-hsiao]. “Shaku and Hachi expresses [or, ‘represents] the ‘right and wrong’ of the Eight Environments [determined by Karma]. “Likewise, this is the same as the ‘Shōrin Flute Without Holes’ [Jap. : Shōrin mu-ku-teki]. Its sound [lit. : ‘voice’] equals that of Ling-shan’s [Jap. : Reizan, 1225-1325] ch’in with no strings [Jap. : kin, the class. Chinese zither] - that music of all music no one ever encountered. Even though Master Li-lao [Jap. : Rirō, no dates] excelled with his jade flute, he did not know that there existed [such a] fragrant medium [?] of mysterious sound [Jap. : myōon hōkai]. You [lit. : ‘the hermit’] smile, and the lower part of the character for ‘deafness’ [is the character for ‘ear’? ]; and that so indeed! “I doubt that the purity of the mountain dwelling hermit Jukushi’s [?, no dates] Four Dignified Manners [Jap. : i-gi] threatens the idolizers of Fu[ke] and Kaku[shin]? “Here, because of Human Selfishness there is little Divine Talent, and following short cuts does not bring about empathy [or, ‘compassion’? - lit. : ‘being intimate with sadness’]. The Liberated Body [or, ‘person’] moves and rests with no restraint [lit. : ‘not unwillingly’]. “Do not in any way obstruct the Authority of the Imperial Court [lit. : ‘the Precedence of the Imperial We’]. That corrupts the state of the world, and … [4 kanji awaiting a satisfying translation]. “Do not accumulate Wealth and Honor; do always practice Poverty and Lowliness. Being at places, do not overdo resting your knees. Being at places, do not exceed [with regard to] satisfying your mouth [i.e. : in terms of eating and drinking]. “Our towns and fields are in full bloom [lit. : ‘are equal to smile’, i.e. : ‘are equal to prosperity’]. Wives and mothers-in-law engage in quarrels [lit. : ‘work hard on stones’]. “The coming of winter accords with the Paper Garments of remote attendants. “Addressed to the hermit Sandō Mugetsu, who has become [or, ‘is’] a Komusō. Japanese authors of bygone days often expressed themselves in quite archaic language and frequently used 'non-standard' ideographs (kanji) in their writings. The actual meaning of such texts often appear to be quite obscure to present-day Japanese scholars and - so much more - to non-Japanese students of the language. "To the hermit Sandō Mugetsu"